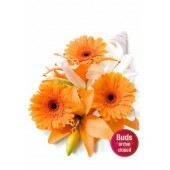 Gerberas is native to south Africa and lush with bright colors and a happy beauty about it. Colors from deepest red to warm yellows,white and peach shades. 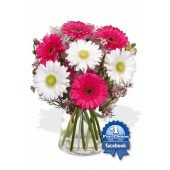 Meaning of the gerbera is happiness, Gerbera would lessen the sorrows and stresses of everyday life as well. Any type of means truth and happiness. 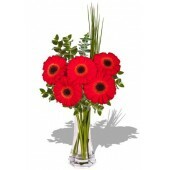 Gerberas are available in rich reds, oranges, yellows and white and color have their meanings which including: orange is sunshine of life, red means unconscious in love or fully immersed in love, white is a symbol of purity or innocence, childlike, ink admiration, adoration or high esteem, yellow cheerfulness. 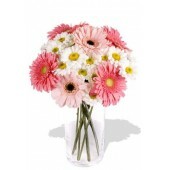 A soft pink gerbera would be a perfect gift to welcome a new baby. 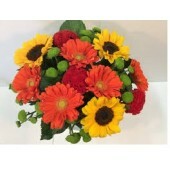 Sunflower which come from North America and across the world through export. 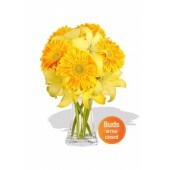 The name for the sunflower is quite literal and taken from its bright sun-like appearance. 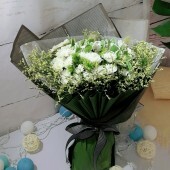 Some of the most common meanings include: long life, feelings of adoration, admiration such as a family member or friend, seeking out positivity and strength, good luck and lasting happiness. Sunflower can range in height from 6 inches to over 12 feet tall, depending on the variety. Stand tall and follow your dreams, focus on what’s positive in your life and don’t let anyone get you down. 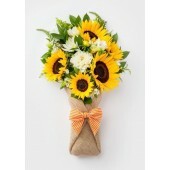 Sunflower bouquet usually use for the congratulation of the graduation purpose. 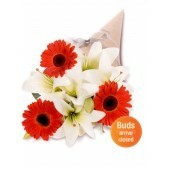 Six Roses Mixed with Six Gerberas Bouquet.. 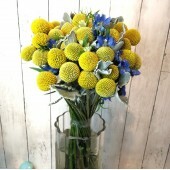 This Sunny Flowers Bouquet with 5 Sun Flowers and Eustoma, Sala Tip and greeny leag in Nice Packing ..
Asiatic and Gerbera Bouquet ..
9pcs Mixed Gerbera and Chrysanthemum Bouquet..
11pcs Mixed Gerbera and Chrysathemum Bouquet..